Medicom Toy continues its popular line of DC Comics Movie MAFEX action figures with a second wave of figures based on the hit film, Suicide Squad! 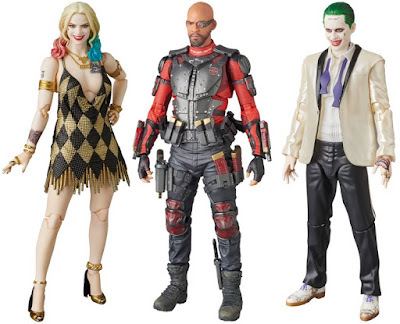 Based on their appearances in the film, these super articulated Deadshot, Harley Quinn and The Joker figures stand 6” tall and include all kinds of character specific details and accessories, like alternate heads and tons of weapons. This wave of Suicide Squad figures marks the first MAFEX release for Deadshot, and new versions of Harley Quinn (Gold Dress Edition) and The Joker (Tuxedo Edition). All three of these Suicide Squad MAFEX Action Figures can be pre-ordered now at Entertainment Earth for around $55 each here.